Or at least linked, and to a blog by someone who doesn’t even know us. 30threads, a new site from Ginny from the Blog, included The Newlyfeds in their latest report on Durham’s food blogs. Food Network, here we come. I was also pleased to discover that 30threads also offers endless potential for procrastination, with links to 30 of the most interesting threads in local blogs. I killed half an hour in between writing these two paragraphs–imagine the possibilities when you’re really trying to accomplish something. But back to food. On Tuesday we received our CSA (community-sponsored agriculture) delivery, and it allayed some fears that I’d been developing about our choice of a farm. Well, actually “choice” is too strong a word. I waited until the last minute (see note on procrastination, above) and so had to go with the only farm that still had space. Except that it didn’t actually have space–something we discovered after we mailed our check, and e-mailed, and heard nothing, and called, and heard nothing, and called, and were finally told that they never got our check and that there was no space anyway. In late June, however, we got a somewhat garbled message from the farmer offering us a share for the remaining half of the season because someone had dropped out. Driven by a desperate need for vegetables instilled by our new weight watching habits, we acted like a high school wallflower who’s just been asked to the prom by the star quarterback. We couldn’t return the call fast enough, and my mid-June we got our first delivery. 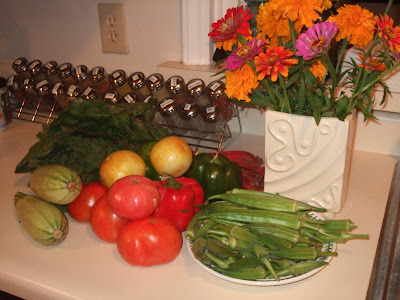 The items we recognized immediately were Swiss chard (in the back), tomatoes, red and green bell peppers, and okra. The green items on the left that resemble miniature watermelons are squash (I’m afraid I didn’t get the variety) and the yellow items atop the red pepper are lemon cucumbers. The flowers weren’t part of the delivery; they’re the ones Fred always buys for me at the Duke Mobile Farmers Market, our pick-up site (for the vegetables, that is). I love that Snow Creek gives us oddball varieties to try. The lemon cucumbers were a delight, with a fresh, clean cucumber taste–although with no hint of lemon. The seeds were large but would be easy to remove using the same process as that for cantaloupe. And the slices would look beautiful in a salad with tomatoes. Unfortunately, we ate them so quickly we didn’t have a chance to find out. We also made a great discovery about the chard stems. I’d thought they weren’t usable, but my 1946 edition of The Joy of Cooking claimed that you could cook them like asparagus. After tasting one raw, I was skeptical: It was awful–bitter, with no redeeming qualities I could identify. All the more reason to put Irma Rombauer to the test. And it appears that she, like my mother, is always right. Once cooked, the stems lost their bitterness. They don’t taste the least bit like asparagus, but roasting them with garlic, oil, onions, balsamic vinegar, and salt made for a delicious dish. Preheat oven to 350. Remove leaves from 10 -12 stems of Swiss chard. (Leaves can be cooked like spinach or other greens.) Cut off about 1/4 inch from the bottom and cut chard into 1″ pieces. Quarter a large onion, lengthwise, then slice. Mince 3-4 large cloves of garlic. Toss all ingredients in a large bowl with 1 tbsp. olive oil, several generous splashes of balsamic vinegar (roughly 1/4 – 1/2 cup) and salt to taste. Spread on jelly roll pan or cookie sheet and bake for 20 -30 minutes. This entry was posted in Cookbooks, Durham Blogs, Our Life, Vegetables. Bookmark the permalink. Roasted stems–yum-o! Never thought of that before. Thanks for the post. Glad we could help you procrastinate. Congratulations on the listing on the 30threads thing. I have a fantasy of being linked on something like that, or being a Google Blog of the Week or whatever they call it. But then, I guess I’d have to be writing about relevant things to achieve that. Hey, at the Divinity School, do you know my housemate Chris, a first year student? Tall, black hair, thick black rimmed glasses?